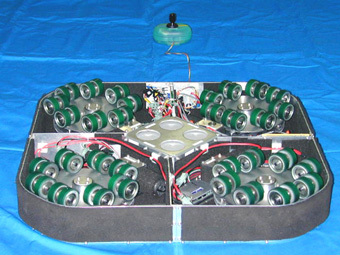 The CirculaFloor is a computer interface; it consists of a set of movable floor tiles. As the user walks in a chosen direction, the floor tile maintains the position of the person in space while measuring out the distance walked. This distance can be fed into a virtual reality simulation, giving the user a realistic sense of moving through a virtual space. "It has often been suggested that the best locomotion mechanism for virtual worlds would be walking. It is well known that the sense of distance or orientation while walking is much better than that while riding in a vehicle. However, the proprioceptive feedback of walking is not provided in most applications of virtual environments. 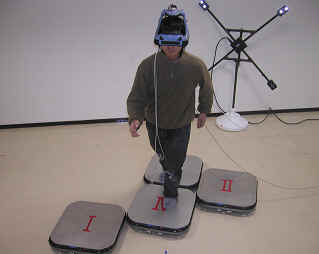 The CirculaFloor is a new locomotion device which provides such a sense of walking. It will make revolution in entertainment or training simulators." If this mechanism works, it would enable the creation of virtual reality environments like the holodeck from the Star TreK: Next Generation starship. The holodeck is an apparently unlimited virtual reality "space" that is contained in a relatively small room within a starship. Take a look at a brief, explanatory video for Circulafloor.